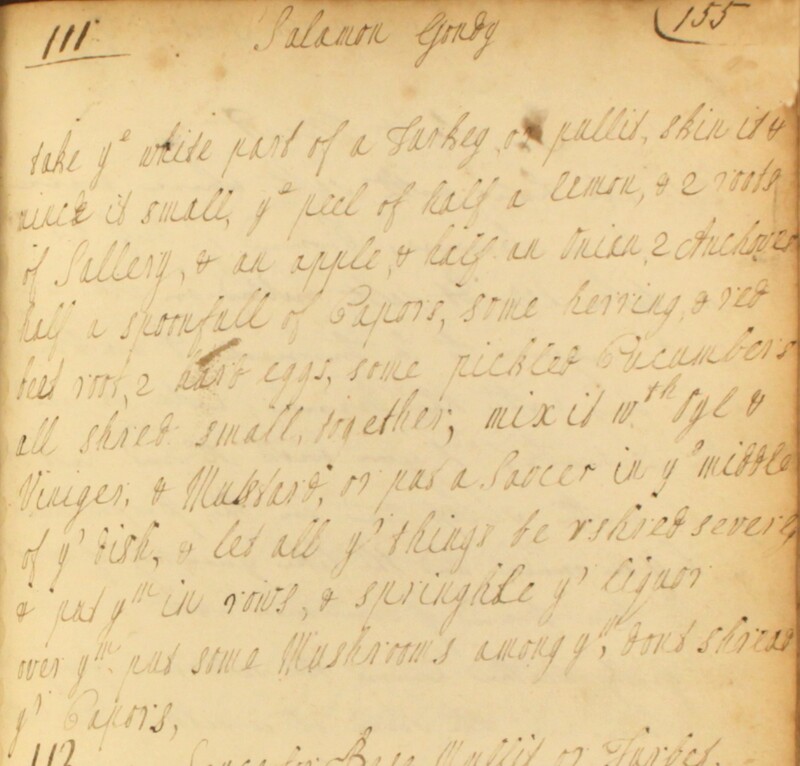 A recipe for a salmagundi or “salamon gondy”, an 18th century salad with chopped poultry, fish, eggs and onions. Take ye white part of a turkey or pullit. Skin it & mince it small. Ye peel of half a lemon, & 2 roots of sallery & an apple, & half an onion, 2 anchoves, half a spoonfull of capors, some herring & red beet root, 2 hard eggs, some pickled cucumbers all shred small, together. Mix it wth oyl & viniger & mustard. 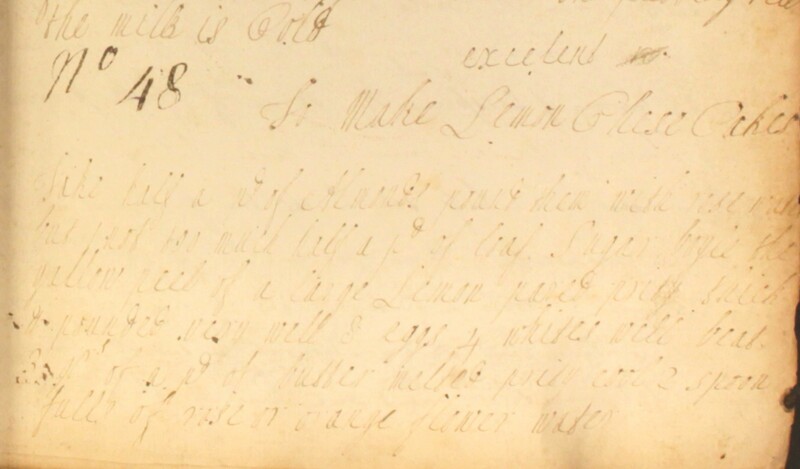 Put a saucer in ye middle of yr dish & let all yr things be shred severly & put ym in rows & springhle yr liquor over ym. Put some mushrooms among ym. Dont shread yr capors. 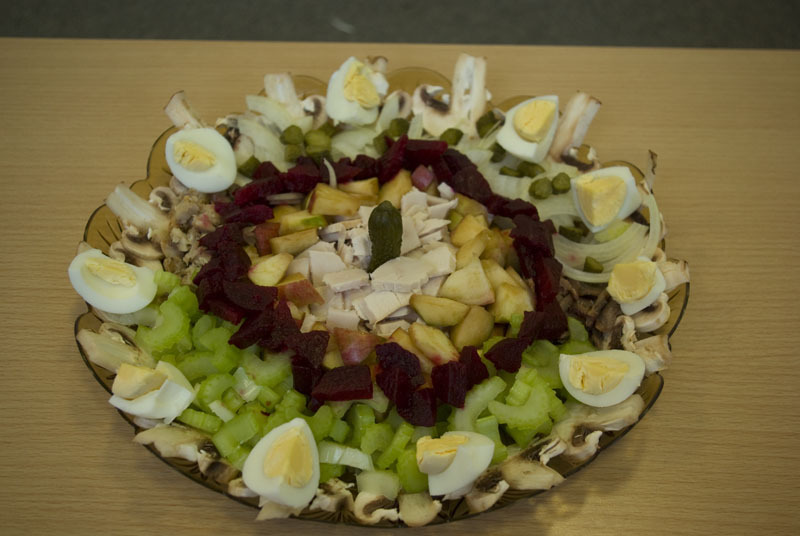 Our Cooking Up History Team’s ‘salamon gondy’! Take the turkey breast, and chop into very small pieces. Thinly slice the onion, herring, anchovies, gherkins. Cut the eggs into segments. Mix the oil, vinegar and mustard to make a dressing. Place a saucer in the middle of your dish. Place the chopped and sliced eggs, vegetables and fish in rows around the dish. Put your chopped turkey breast on the saucer at the centre of the dish. Slice the mushrooms and scatter over the dish with the capers. Take half a pd of almonds. Pound them with rose water, but not too much, half a pd of loaf sugar. Boyle the yallow peel of a large lemon pared prity thick & pounded very well, 8 eggs, 4 whites well beat, 3 qrs of a pd of butter melted prity cool, 2 spoon fulls of rose or orange flower water. Mix all well together & bake them. Lemon cheesecakes, fresh out of the oven! Take strips of peel from the lemon and boil for a couple of minutes. Drain and allow the peel to cool. Melt the butter on a low heat, then allow to cool. Mix the almonds with the sugar and rosewater. Chop the cooled lemon peel very fine and add to the almonds. Beat the egg whites until they are light, fluffy and form soft peaks. Beat the 3 whole eggs and melted butter into the almond mixture, and add a good squeeze of lemon. Carefully fold in the beaten egg whites, keeping as much air in the mixture as possible. 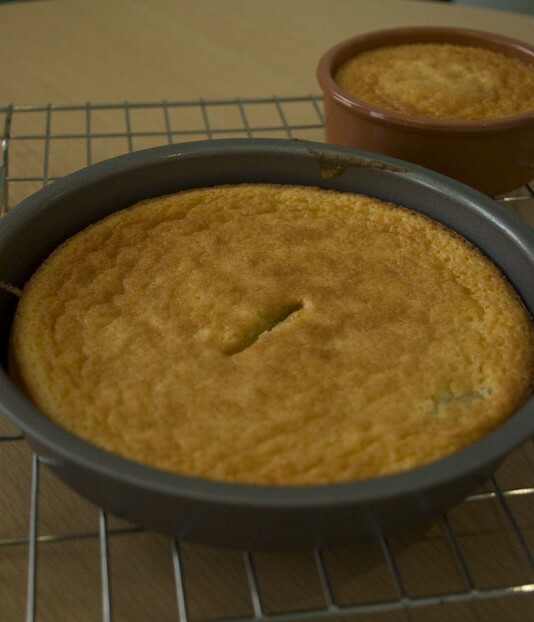 Spoon the mixture into sandwich cake tins or large ramekins. Bake in the oven at 180ºC until cooked through and golden brown. We’d love to hear how you get on with making up the recipes. Drop us an email at archives@westminster.gov.uk or leave a comment on the blog! This recipe reminds me of a modern ‘impossible pie’ which also contains flour, but similar technique. I’m really enjoying your project, thank you! Re the recipe for ‘Excellent Lemon Cheesecakes’ – in the list of ingredients you forgot to list ground almonds and in the instructions no oven temperature was given. However, as an experienced historical re-enactor who specialises in cooking, I was able to work out the quantity by looking at the proportion of almonds to sugar in the original recipe. I took a punt on a medium oven anf got excellent results. I made individual cheesecakes in paper cases and took them to a drill session of my Napoleonic era re-enactment group. They were very well received. I will be trying a lot more of these recipes and will let you know how I get on (just a shame I don’t live in London – I would love to be involved in one of your ‘practice’ sessions. It’s great to know you are trying out recipes from our Cookbook at home. We’d love to hear more about your results. If you’d like to share photos of some of the dishes you’ve made, you can email them to us at archives@westminster.gov.uk and we will post them on the blog. I’m sure our other readers would be keen to see some more of the recipes brought to life!